A two-story vessel tastefully furnished in an ultramodern style, the Enchante’s allure is that of classic barge cruising coupled with contemporary luxury. Enchante is the brainchild of Roger and Louisa Gronow, who have been in the barging industry since 1995, and 1998, respectively. This delightful and energetic couple met as crew in 1999, and, in 2009, they purchased Enchante and introduced her on the Canal de Midi. Now mostly managing the barge from land, the Gronows oversee everything from the crew, cuisine, and excursions to ensure a flawless cruise. This extensive background in boating and hospitality extends to the Enchante’s effortless balance of conventionally comfortable cruising with the convenience of premium amenities. The open kitchen, for instance, allows foodie guests to enjoy spontaneous cooking demonstrations from the Chef, while the especially large hot tub on the deck is a welcome feature on sunny days! 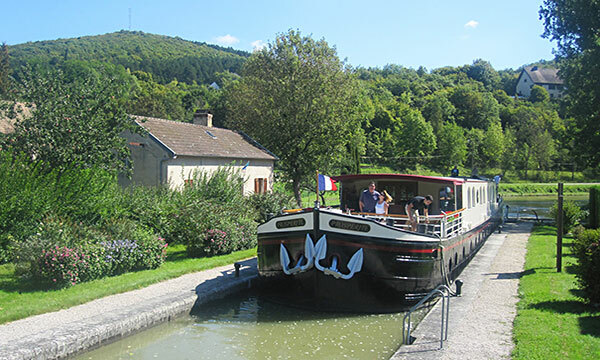 As the only two-story barge on this charming waterway, Enchante also has bragging rights to the largest cabins on the Canal du Midi. The route is deep in the heart of the Canal du Midi, where the tree-shaded towpath beckons for leisurely bike rides and relaxed strolls. A distinctive itinerary features visits to working wineries, tours of local landmarks, and stops at sites of historical interest. Gastronomes are invited to sample the regionally inspired cuisine, created seasonally to fully showcase the area’s rich flavors, abundant produce, and fresh seafood. Wine pairings are specially selected to introduce guests to the Languedoc’s many vintages, both from established and emerging vineyards. In the afternoon, you will be met by a crew member of the Enchante at the designated meeting point. 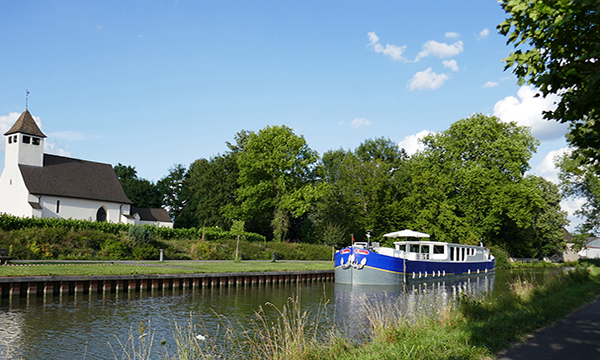 From here, relax as you are chauffeured to the barge, moored nearby in Sallèles dAude. A traditional champagne welcome and introduction to the crew awaits you, before your first of many gourmet dinners onboard. After dinner, the hot tub beckons! A leisurely morning cruise presents the perfect time to relax on deck. Upon mooring, bookworms are invited to browse a unique book shop with approximately 50,000 second-hand books! In the afternoon, your Tour Guide chauffeurs you to a olive pressoir for a tasting of small batch olive oils; a visit to Minerve then follows. A preserved Medieval city, Minerve boasts fascinating social, historical, and military import. Back onboard, visit Chef in the open galley for a cooking demonstration, followed by cocktails and dinner. The morning begins with an escorted visit to Narbonne, a regional capital established in 118 B.C.E. as a Roman colony. A study of European history and local modernity thriving side by side, Roman ruins are presented in public spaces, while the lively Narbonne market reflects the region’s gastronomic bounty. Return to the barge for an afternoon cruise. Laze on deck, or explore the towpath's flora and fauna with a bicycle ride or leisurely stroll. Join Chef in the galley to observe French cooking techniques before dinner is served. This morning, your Tour Guide escorts you to a Benedictine Abbey founded in the 8th century, nestled in the village of Lagrasse. Explore this delightful town in the heart of the Corbieres, where charming avenues house a multitude of specialty boutiques and craft shops. Sample authentic local cuisine with a gastronomic luncheon in a dining venue overlooking the Corbieres vineyards. Back onboard, this afternoon's cruise is the perfect time to or explore the tree-shaded towpath by bicycle or on foot. Cocktails and dinner culminate the day. . This morning's cruise is the perfect time to relax on deck with a cup of coffee and watch the scenery slip by, or traverse the towpath via bicycle or foot. This afternoon's excursion is a to a vineyard visit coupled with a wine tasting at Chateau Ollieux Romanis in the Corbieres, which is one of the few regions to receive the esteemed AOC appellation. Your Tour Guide chauffeurs you back to the barge, where you can take laze the hot tub or visit Chef in the galley before drinks and dinner are served. This morning, your Tour Guide chauffeurs you to Carcassonne, a fortified Medieval fortress with a walled city. Explore the ancient castle and preserved ramparts to admire the mighty 53 Roman towers. Stroll the cobblestone boulevards into local cafes and specialty boutiques. Return to the Enchante for an afternoon cruise, and explore the tree-shaded towpath on bicycle or on foot, or relax on deck with a glass of wine. Cocktails and canapes precede tonight's elegant gourmet repast at the Captain's Dinner.